There was a time when I was petrified to fly. Those days are long behind me. Today, I fly on an average of 2-3 times per month. Recently, I discovered that listening to Palestrina in flight is a near sacramental experience. 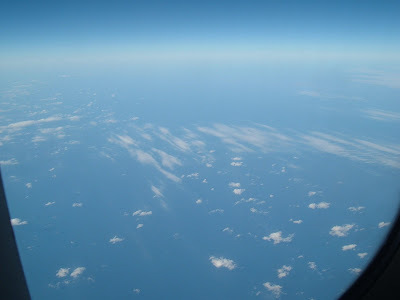 I snapped this photo last Friday morning, somewhere off the Atlantic coast at an altitude of 39,000 feet. As you look at the picture, you can see the curve of the earth's surface. Enjoy.